Texan Girl Talks: Why I quit my dream job. Why I quit my dream job. Yes, you definitely read that right. I have been doing a little LOT of soul searching and found out how much I needed some peace in my life. Since moving to California, I've been on-the-go the entire time and didn't pay attention to myself. I realized that I was doing myself a real disservice. Public service announcement: Your mental health is one of the most important aspects of your life. Period. There was a period of time where I didn't enjoy working out anymore. I stopped doing yoga, I basically stopped everything that I loved to try to put my all into my job, my BSN program, the new grad program I was attending, and getting used to California all after moving from everyone and everything I knew. It was too much. I started feeling so bad that I would wake up with chest pains. I started doubting everything I knew. That my friends is: Anxiety. That's when I realized I needed a new game plan. Yes, I quit my job. My dream job. Something i'd been working towards for so long. You know what though, once I quit my job, I started to feel better. I was not waking up with anxiety and anticipation for the next shift. I was not worrying myself silly about all the traffic I had to get there. I started doing things for me again. I started to feel balance. Balance that I had lost. Balance that I desperately needed. I tell you all of these things because as nurses we tend to focus on our patients and sometimes when that's all we focus on, we often forget about ourselves. We forget that if we don't take care of ourselves, how can we care for our patients? 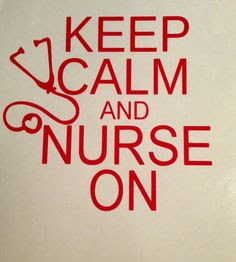 This doesn't mean I'm any less of a nurse or that my career is over..Which I was completely convinced, when my husband said maybe it would be a good idea that I quit for now. I literally was in tears and the very thought of quitting my job was unfathomable. I felt like I was giving up on my patients and really more than anything I felt like I was giving up on myself. I was so convinced that this was the only place for me. I was wrong. Without the balance in my life, I was only harming myself. I know this is only a pit spot. A slight pause if you will. It took a lot of courage to write this post, but I had to. I want anyone of my friends, nursing or not, that nothing is worth your mental health. Nothing. So if you need to take time for yourself. Do it. Anxiety is real in anyone's world, whether it is small amounts, or incapacitating amounts, we all live with it in some form. The balance and awareness of it, make it bearable. Your life is too important to be anything but happy. For now I'm doing a lot of yoga, focusing on hanging out with new/old friends, traveling California, as well as focusing on my bachelors degree,hanging out with my main squeezes, Matt, Lou, and Giz, and relying on the support of some amazing friends. Today, I feel good and I keep positive that I will find my dream job once again! Until the next post! Stay amazing, people!